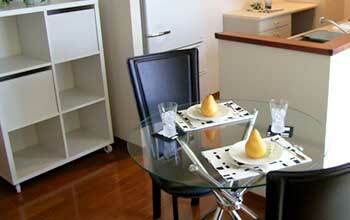 Accommodation and Furnished Apartment in Tokyo, Japan. Following　questions　are　frequently　asked　by　our　customers. If　you　do　not　find　the　answer　to　your　question　below,　please　feel　free　to　ask　us. ・Can　I　rent　the　apartment　weekly　or　daily? ・Can　I　see　the　apartment　before　making　a　reservation? ・How　do　I　check　the　vacancies　of　the　apartments? ・How　do　I　make　a　reservation? ・What　do　I　need　to　sign　a　lease? ・Can　I　make　a　reservation　in　advance? ・Is　there　a　telephone　line　activated　in　the　apartment? ・Can　I　use　the　Internet　in　the　apartment? ・Do　I　need　to　pay　a　deposit　or　any　fees　besides　rent　and　utilities? ・What　utilities　are　included　in　utility　fees? ・Do　I　need　a　Guarantor? ・Can　I　have　a　roommate? ・Can　I　have　a　child　in　the　apartment? ・Can　I　extend　my　stay　after　the　lease　has　expired? ・Can　I　make　a　reservation　with　a　credit　card? ・Is　the　utilities　fee　fixed? Can　I　rent　the　apartment　weekly　or　daily? No. The　minimum　stay　is　at　least　one　month. However,　after　your　first　month　it　is　possible　to　extend　your　stay　in　a　daily　or　weekly　basis　by　renewing　the　lease. Can　I　see　the　apartment　before　making　a　reservation? Yes. You　will　need　an　appointment　to　see　the　apartment,　so　please　contact　us　in　advance. How　do　I　check　the　vacancies　of　the　apartments? Please　go　to　"Availability"　on　our　homepage. However,　vacancy　changes　everyday　and　updates　are　sometimes　not　current　for　that　day. Please　contact　us　for　the　latest　availability. How　do　I　make　a　reservation? Please　go　to　"Contract　Concluding　Procedure"
What　do　I　need　to　sign　a　lease? All　tenants　need　a　passport,　visa　and　Alien　registration　card(if　staying　more　than　3　months). Can　I　make　a　reservation　in　advance? You　can　make　a　reservation　no　earlier　than　2　weeks　before　your　move-in　date. Is　there　a　telephone　line　activated　in　the　apartment? None　of　our　apartments　have　active　phone　lines. We　highly　recommend　the　use　of　mobile　phones　due　to　the　high　cost　of　activating　a　phone　line　in　Japan. We　do　have　prepaid　mobile　phones　for　sale. Can　I　use　the　Internet　in　the　apartment? Do　I　need　to　pay　a　deposit　or　any　fees　besides　rent　and　utilities? No,　you　don't　need　to　pay　a　deposit. (with　the　exception　of　Colline　Kugahara). 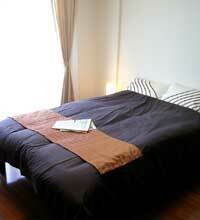 The　only　initial　payment　besides　first　month　rent　and　utilities　is　the　"cleaning　and　linen　fee"　(usually　30,000　yen). The　only　monthly　fees　you　will　pay　thereafter　are　rent　and　utilities. Note:　some　apartments　require　extra　fee　for　parking　for　bicycles　etc. What　utilities　are　included　in　utility　fees? Electricity,　water　and　gas(also　internet　if　the　apartment　has　internet)are　included. No,　you　do　not　need　a　Guarantor(except　for　Colline　Kugahara). However,　we　will　require　emergency　contact　information. Can　I　have　a　roommate? Yes,　you　can　have　a　roommate. Maximum　of　2　tenants　are　accepted　at　our　apartments. We　do　not　charge　any　extra　rent　for　additional　tenants. Can　I　have　a　child　in　the　apartment? No　children　are　allowed　to　live　in　the　apartments,　with　a　few　exceptions. Please　contact　our　office　for　more　information. Can　I　extend　my　stay　after　the　lease　has　expired? You　can　extend　your　stay　by　renewing　the　lease　contract. To　renew　your　lease　contract,　you　need　to　give　us　an　extension　notice　one　month　before　your　contract　ends. Forexample,　if　your　contract　ends　on　4/30　but　you　want　to　extend　your　stay　for　2　more　weeks,　you　need　to　give　us　a　notice　by　3/30. If　we　don't　receive　a　notice,　we　will　start　accepting　new　tenants　and　you　may　not　be　able　to　extend　your　lease. There　is　no　cost　to　renew　your　contract. Can I make payments by credit cards? Yes, we accept VISA and MASTER. Is　the　utilities　fee　fixed? Yes,　they　are　fixed. However,　when　your　total　utilities　go　beyond　the　fixed　amount,　we　will　charge　you　the　difference.